Downhill mountain biking is one of the most technical and exciting of all of the offroad disciplines. Riders are timed down a single downhill track, and the fastest rider down the mountain wins. Races can be from 2 – 5 minutes long, depending on the length of the track. Each rider starts individually and is timed against the clock. Generally the races are held over two days, with the first day being open practice and the second involving a seeding and race run. Tracks can have a variety of different technical features such as rock gardens, jumps, roots and berms. There are always alternative racing lines that for less-skilled riders to bypass jumps and still be competitive in their category. 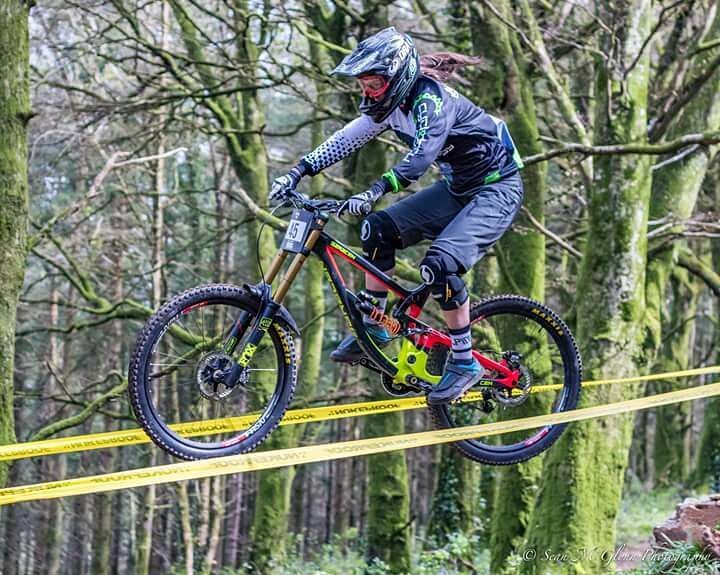 Riders who have competed in Enduro events would be capable of riding any of the Downhill tracks in Ireland. Ireland has a long history of successful female downhill mountain bikers, with multiple European and World Masters Champions coming from Ireland. More recently Tara O’Boyle has been successful in Ireland and the UK, and Sacha Bickerstaff competed in Junior and Senior World Cups. A downhill specific bike will have both front and rear suspension and are usually heavier than other bicycles. Wide, nobbly tires (between 2.25” and 2.5”) are used for gaining grip on tracks. Although downhill bikes can be expensive, there are lots of second hand bargains to be picked up on Facebook Buy and Sell pages, club websites, and word of mouth. Although most riders would use a Downhill bike, some riders would use Enduro style bikes also. A full face helmet is mandatory for downhill races. Riders would also sometimes wear knee and shin pads, elbow pads, body armour, neck braces and eye goggles. Skinsuits and lycra are not permitted in downhill races. Underage riders have mandatory regulations for protective gear. Where can I start riding downhill? Downhill is a racing discipline of mountain biking, and there are lots of places that you can ride around the country. Which clubs specialize in downhill mountain biking? How can I start racing downhill? The downhill race season usually runs from March to September with the IDMS being the main league in Ireland. Many riders would travel to the UK and further afield for more racing. Find out more about downhill mountain biking by checking out some of these links.